"Winds of Fire", the latest book by Ann Merritt (Highland Press), is a story of murder, love, and the dedication of our U.S. Special Forces. It takes place in beautiful coastal Georgia and leaves readers anxiously anticipating the next turn in the characters’ struggle for truth and justice. I was very happy to be able to write about the dedication and perseverance of Kip McTeer, who represents the courage and sacrifices made every day by members of our Armed Forces. Author Ann Merritt recently released her third book, a southern romantic suspense titled "Winds of Fire". Set in Savannah, Georgia and nearby Tybee Island, the story revolves around Kip McTeer, a U.S. Special Forces Operative and his high school sweetheart, Anna Hanley. While the two haven’t seen each other in many years, they are brought together by the violent murder of Anna’s sister. As they work together to learn who is responsible, a much more sinister plot is uncovered, and one that sheds light on the overseas bombing that killed McTeer’s family years earlier. "Winds of Fire" is dedicated to Ann Merritt’s late husband, MacAllister Merritt, and also to the U.S. military service men and women who protect the freedoms enjoyed by all Americans. “I was very happy to be able to write about the dedication and perseverance of Kip McTeer, who represents the courage and sacrifices made every day by members of our Armed Forces,” said Merritt. In her latest book, Merritt continues the same masterful storytelling and skillful character development that she displayed in her earlier works, "A Cry From the Cold" and "The Highlander". 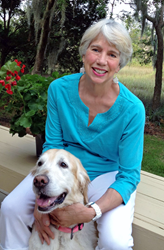 Her ability to draw readers into the emotional struggles of her characters is matched only by the vivid pictures her words paint of life on the Georgia coast. “As a long-time resident of Savannah, I enjoyed writing about some of the most beautiful places in this part of the country,” said Merritt. About Ann Merritt: Originally from New Jersey, Ann Merritt grew up in Connecticut and Michigan. She is a graduate of the University of Wisconsin and the University of Alabama, and enjoyed a career as an art teacher and clay sculptor before living her dream of writing suspense novels. Ann is currently working on her fourth book titled "Marsh Winds", which is expected to be released in 2015. All of her books are available on Amazon.com. To learn more about Ann, please visit her website at http://www.annmerritt.com.